Thought I’d describe what you get when the shiny new 2RU Nutanix block gets to your door and how to get it configured to a basic level from the point of view as a new user of the Nutanix solution. Obviously, talk to your Nutanix partner before diving in, but this should give you a bit more of an idea on what you need to do to prepare. The next thing I did was send an email to Nutanix support to get registered as a customer when then allows you access to the knowledge base. Within about 10 minutes I had a reply and login to their support portal. I searched for ‘setup’ and got the setup guide. If you aren’t sure what version to get, contact support – they are very fast to respond. In my case it was v2.6.2 (latest for Oct 2012). Physical cabling was easy: 2 power cables (carve off to separate UPS power feeds); Each node has 1 x 10GigE network interface and 2 x 1 GigE interfaces for failover of the 10GigE as well one IPMI (lights out management) 1 GigE interface. That’s it. I assigned the IPMI as access ports and the 10Gig and 1Gig uplink-to-network ports as trunks. The guide itself is pretty straight forward and easy to follow and the easiest method is to use IPv6 to configure the cluster. I used a Win7 laptop with IPv6 enabled, Bonjour for Windows, Google Chrome (with DNSSD extension) and your typical dumb gigabit switch to hook it all up in an isolated environment initially (if you want to isolate it). The cluster uses the 1 gig interfaces as a failover to the 10 gig nics, so that’s why it works on a basic 1 GigE switch. The setup process assigns IPv4 addresses to the cluster components so don’t worry about needing to be an IPv6 guru – you don’t. You don’t have to use Win7, other OS options are ok too. I didn’t try any other OS/browser combo so YMMV. In my case I’ve assigned a complete /24 subnet in the DC for Nutanix infrastructure. It is recommended that all the components are in the same L2 domain but it is not mandatory. Addresses will be split out between the ESXi hosts, IPMI adapters and Nutanix controller virtual machines. Do not use 192.168.5.x/24 as this is reserved for the cluster’s internal communication. Block 2 Node A     10.1.1.25     10.1.1.125          10.1.1.205  … and so on for any future nodes. I don’t think I’ll ever have 54 nodes so that sequencing should be ok :) The controller virtual machine is where all the magic happens. There is one of these per node and the key to the whole Nutanix solution is the software and processes that run within the Controller vm; keeping everything in check and optimised; even in the event of failure. The block ships with evaluation versions of vSphere ESXi hypervisor, vCenter server, Windows 2008 R2 Enterprise (for vCenter), MS SQL 2008 Enterprise (for the vCenter database). You can apply your own licenses as appropriate. Each host has its own local datastore (stored on the SATA SSD) and the distributed NFS datastore is comprised of the FusionIO drive (PCIe SSD) and the SATA disks. There are also ‘diagnostic’ vm’s pre-deployed which are used to benchmark the performance of the cluster. You do not have to use the vCenter and you can decide to use your pre-existing one (it will save you a license). At this stage I’ll probably keep a separate vCenter for the VDI deployment but that is up to your own individual deployment scenario. Once the cluster is ‘up’ you can then follow the guide and configure NTP and DNS from the CLI, configure the vMA, configure the cluster and hosts in vCenter, install the VAAI plugin and the NFS storage. I also added an external non-Nutanix NFS datastore to all ESXi hosts so that I could use it as a transfer mechanism to get vm’s and templates from existing vSphere infrastructure to the Nutanix block should I want to. Note that there is a way to allow external-to-Nutanix ESXi hosts to connect to the internal Nutanix NFS datastore, however I think it is easier and better to keep the only hosts that can write to the Nutanix NFS datastore as the Nutanix nodes themselves. When you take into account picking up the box from the loading dock, unpacking, lifting/racking, cabling, getting your Win7 laptop ready, cluster and vSphere configuration, DC network configuration, moving from isolated to production, installing the VAAI plugin, configuring NFS storage and final checks I’d say you were looking at a few hours in total to complete. Obviously adding any more blocks will take significantly less time given most of the clustering components are already done. The ease of configuration and administration of the Nutanix block has been great. The other thing to keep in mind is that the support team from Nutanix (and their partners) can assist you with the above deployment process if you like. So, at the end, you have a complete storage and compute modular building block that is easy to deploy and scale out when you require. In the coming weeks I’ll provide updates on the experience on using the block for our VDI project, as well as going into some detail on how the block has been designed from the ground up to handle a lot of different failure scenarios. Be sure to check out some of the Nutanix YouTube videos as well if you haven’t done so: http://www.youtube.com/user/Nutanix and get ready for a life without a SAN in your DC. 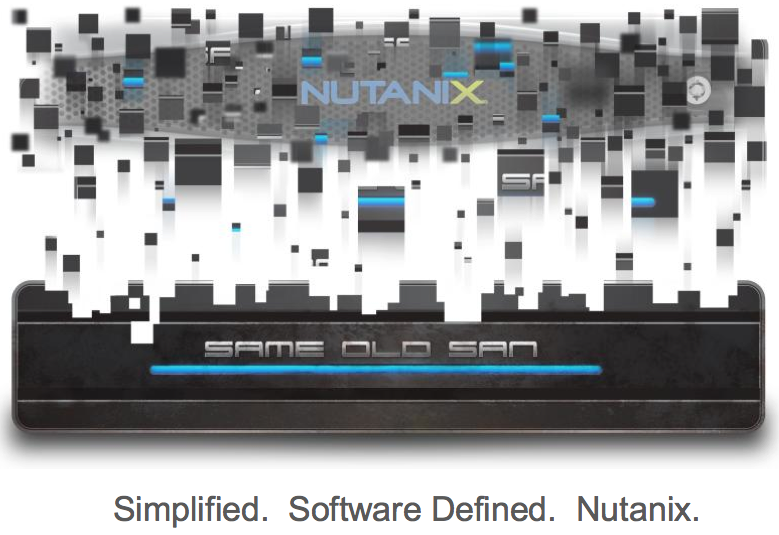 This entry was posted in Nutanix, vmware and tagged configuration, converged, install, nutanix, vmware on October 23, 2012 by Cameron Stockwell.